This year’s Power Con Convention will be the host of three new exclusive Masters of the Universe Classics Club Grayskull (or Filmation) action figures. Today the first one was revealed over at Power Con’s official website, and the newest MOTUC figure is none other than Spikor! 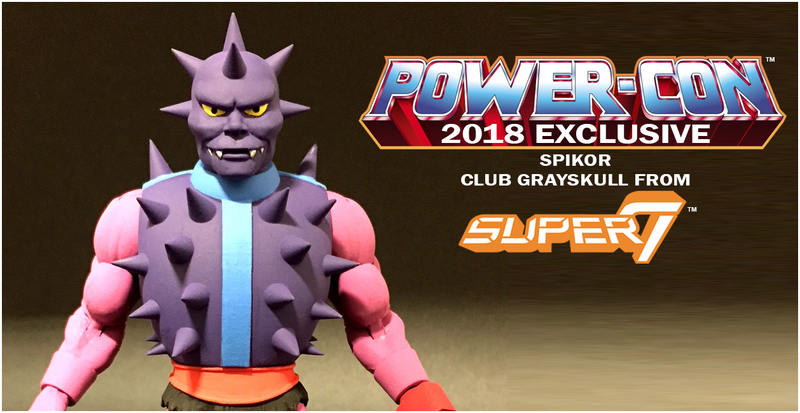 Say hello to the first of three Power-Con 2018 toy exclusive reveals: Spikor from the Club Grayskull (Filmation) series! Sculpted by the Four Horsemen and produced by Super7, Spikor goes up for pre-order (along with ticket pre-sales) on Saturday, April 7th at 9:00am Pacific / 12:00pm Eastern time! We pushed the start date to Saturday to make initial ticket and exclusive pre-sales more convenient for most fans. The pre-orders for the toy exclusives will run until Sunday, May 13th. Ticket sales to the show will continue after that date. That gives everyone approximately one month to place their toy exclusive pre-orders. In order to move into production, we can’t extend the end date. All pre-orders are a pre-payment, in full like prior Power-Con events. We’ll have more info as the pre-sale date draws closer! And please check back tomorrow for the next reveal.